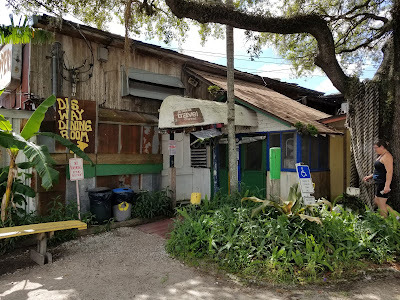 A few months later, I found myself in Tampa a few miles away from Skipper's Smokehouse at lunchtime. The restaurant looks very haphazard from the outside, with all sorts of random buildings all put together to make up a compound that includes the restaurant, bar, and concert venue. I already knew what I was ordering. 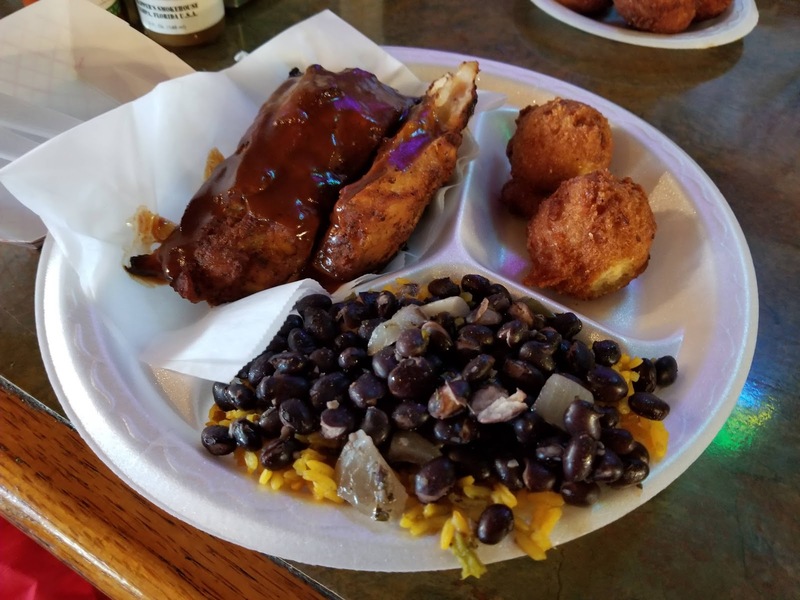 The alligator ribs came with two sides (I had beans & rice and steamed vegetables) and hush puppies. The ribs had a tasty barbecue sauce on them. In terms of consistency and taste, I'm not sure if I would have known they were alligator on a blind taste test. With the sauce and smoked meat flavor, they tasted like pork ribs to me. The consistency was a little tougher, almost like pork ribs that weren't smoked for long enough. The bones in the ribs gave away that I was eating a different animal, appearing much skinnier than a typical rib. I can now cross reptile ribs off of my food list. These alligator ribs are probably the closest I've tried to a Florida style BBQ, because you can't get much more Florida than alligator. They were good, but if I returned to Skipper's Smokehouse, I think I'd try some smoked fish next time. I'm a big fan of smoked fish and their smoked mullet was calling out to me as I was reading the menu!